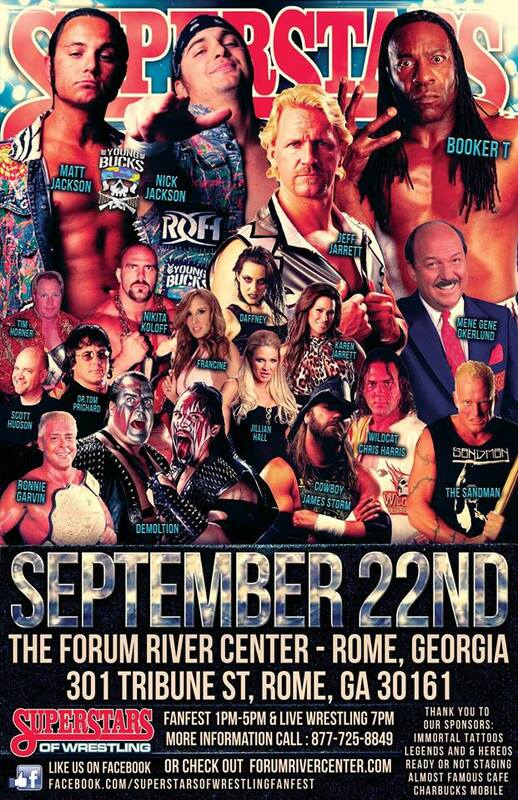 Matt and Nick Jackson will officially be a part of the huge event, Superstars of Wrestling, at the Forum River Center in Rome, Georgia, on September 22nd. This once-in-a-lifetime fan fest will include names like WWE Hall of Famers Booker T, Jeff Jarrett and Mean Gene Okerlund. NWA legends Ronnie Garvin, Nikita Koloff, former WWF tag team champions Demolition, and ECW Originals The Sandman and Francine are slated to appear. There will be a special reunion of America’s Most Wanted – ‘Wildcat’ Chris Harris & ‘Cowboy James Storm – as well as many other legends of the past, present and future.